Compte rendu publié dans Acta fabula (Février 2018, vol. 19, n°2) : "Dossier : Le Moyen Âge pour laboratoire": Florian Besson, "Les automates médiévaux, entre science & magie"
Philadelphie, University of Pennsylvania Press, 2015. A thousand years before Isaac Asimov set down his Three Laws of Robotics, real and imagined automata appeared in European courts, liturgies, and literary texts. Medieval robots took such forms as talking statues, mechanical animals, and silent metal guardians; some served to entertain or instruct while others performed disciplinary or surveillance functions. Variously ascribed to artisanal genius, inexplicable cosmic forces, or demonic powers, these marvelous fabrications raised fundamental questions about knowledge, nature, and divine purpose in the Middle Ages. 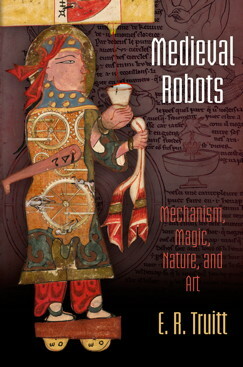 Medieval Robots recovers the forgotten history of fantastical, aspirational, and terrifying machines that captivated Europe in imagination and reality between the ninth and fourteenth centuries. E. R. Truitt traces the different forms of self-moving or self-sustaining manufactured objects from their earliest appearances in the Latin West through centuries of mechanical and literary invention. Chronicled in romances and song as well as histories and encyclopedias, medieval automata were powerful cultural objects that probed the limits of natural philosophy, illuminated and challenged definitions of life and death, and epitomized the transformative and threatening potential of foreign knowledge and culture. This original and wide-ranging study reveals the convergence of science, technology, and imagination in medieval culture and demonstrates the striking similarities between medieval and modern robotic and cybernetic visions. E. R. Truitt is Associate Professor of History at Bryn Mawr College.